View this video about the persecuted church around the world. Go to www.wildershow.com and click on Send Bibles to help. In education, a fine line exists between challenging a child and frustrating a child. The only way to find the balance is to truly know the child. In one of our co-op classes, I co-teach a class with 23 students. Ten or so are freshmen, five or so sophomores and juniors, and one senior. With such diversity, we have such a difficult task finding assignments that are challenging to all, yet not frustrating to any. Isn't this why we homeschool to begin with, so we can tailor our learning to the specifications, the bent, of the child? I suppose the best solution is to modify the workload. In a co-op setting, just as in a school setting, we release some of our rights, our control, over our children's education. This is one of those instances. If only we had more time, more hours in the day, or at least more hours of class time, we could do so much better. But a co-op is truly a partnership between parent and teacher. We just have to pray God will give the parents the wisdom to see what their own children need, and provide as He always does. How did Laura Ingalls Wilder do it? And I was born a child. To be a lamb is great. This week were blessed to babysit for my lifelong friend's 3 & 5 yo children. We had such a wonderful day doing preschool activities, playing dress-up, playing cars & planes, working puzzles and cooking in the pretend kitchen. This is such a fun age. Those of you with preschoolers, enjoy them! There will soon come a day when all problems can not be solved with a popsicle, and kissing it no longer makes it better. These are precious years and they pass so quickly. What a refreshing day! Thank to my dear friend for sharing your sweet little blessings with us! We love our co-op. We get together with the 100 families who are our closest friends (ok so I don't know some of them) once a week and exchange teaching skills. I teach what I'm good at, and others teach what they are good at, and the kids get all the benefit. We have really developed some good friendships there, and we look so forward to our 10 weeks in the fall and 10 weeks in the spring! We are going on Week 3. I teach Humanities with 2 other ladies, and I also teach the Shakespeare class (1st-3rd grade) and a Movies As Literature class called Thumbs Up (9th-12th grade). Plus I get to help with preschool, which is the highlight of the whole day. All of this makes for a very fun, very exhausting day. But also fun. And exhausting. Of course we do many other subjects at home, that are not part of co-op. We follow the Ambleside Online curriculum, although we have deviated somewhat to avoid overlap with subjects covered at co-op. Our at-home subjects include Bible, English, handwriting, math, critical thinking, character study, art, artist & composer studies, home economics, hymns, folk songs, nature study, Greek, Latin, Spanish, French, Italian and whatever else sounds really fun. We do a lot of reading around our house. Admittedly, homeschooling is a lot of work. But it's also a lot of fun. Besides, what better things do I have to do for the next 10 years? A thread running through a yahoo group I'm on is asking us to talk about our pets. I thought you guys might also want to know what other craziness exists in our home, besides the adorable Littluns. We are, in fact, downsizing in the pet department. My rule is that all kids get to stay, but pets have to tow the line if they want to stay. I run a pretty tight ship - in the pet department anyway. Sometimes I don't even give three strikes before they're out. First, you will all be glad to know that we got rid of Ashley Bonnie, the dog who tried to eat my daughter's face last winter. We loved that dog but you have to draw the line somewhere. (That is a story for another post. I learned a lot of valuable information about dog bites. After the fact, of course. And she didn't really try to eat her face, she actually bit her on the lip, but it's all the same to me!) Too bad. 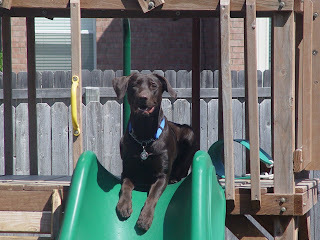 Other than that incident, she was the best dog we ever had. Our cocker spaniel, Cocoa Evangeline, turned out not to be lake material. She kept getting burrs the size of quarters in her long fur, and she loved to find dead fish and roll in them. Why are dogs so weird? 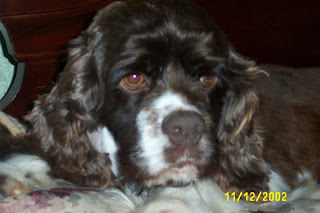 When the burrs were so bad that her ear was folded in half and stuck together, I started looking for other options. My mother-in-law adopted Cocoa earlier this summer, and she loves being part of their family. Plus, we still get to visit. She also was a weird dog - she had an obsession with our fish tank, and would sit for hours and watch the fish swim. Apparently she now obsesses over their guinea pig, so she's happy. We gave away our adorable lop-eared bunny a couple of years ago to a sweet friend, before he got really huge. (The bunny, not the friend. The friend is a girl. And not huge). Of course, we immediately replaced the Little Bunny Boo-Boo with 2 kittens (who turned into cats, it's true, but honeslty you hardly ever see them so, if you count by Hours They Are In The Way, they barely count at all). Finally, our lion fish has some barbaric tendencies and keeps killing the other fish with his poisonous barbs. I think he's killed about 12. As of yesterday he is now King of the Hill. We really thought we were safe as long as we got fish who were too big for his mouth. Turns out he kills just for fun. Sicko. He even killed the shrimp & tried to eat it. He couldn't get the shrimp to fit so its claws are hanging out of his mouth. He eventually spit it out because, duh, it has an exoskeleton! Fish are so dumb. So...that leaves us with 2 dogs (Beau Antonio, a 140 pound lab and Diego Alejandro Frisco Pasado Laredo, a 4 pound chihuahua, guess who's in charge? 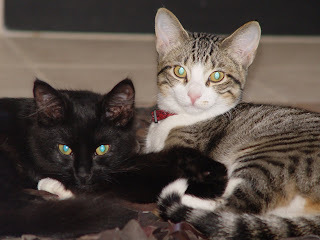 ), 2 cats (Mary Kate and Jackie, but you'll probably never see them if you come over) and 1, read it again, 1 fish (Aslan, who the kids have decided is actually a Devil fish and needs a new name. Aslan seemed to fit because he's a lion fish but that was before we knew him). Imho, you can't really count all the critters that my kids are forever coming home with, or the snake I killed in the garage last week (btw an axe works way better than a shovel - why do they always tell you to get a shovel?) because they aren't pets. They're more like experiments. Three Little Detectives. Left to right: Detective F-Meier (Lil Yoda), Detective E-Meier (Padme) and Detective S-Meier (KMe). 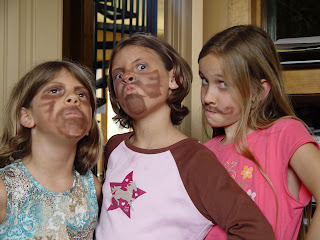 Never leave children unsupervised around makeup. I must tell you about an exciting field trip we went on this week. A nearby city has built a huge complex called Safety Town. In the main building are classrooms, a fire engine & wall of fire tools, etc. (and of course a gift shop where we dropped $20 for Safety Town t-shirts). 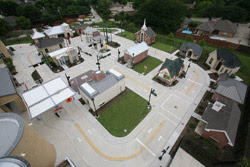 Outside is a complete, miniature town designed to teach the kids about safety issues. "The complex consists of an 8,000 square foot Educational Facility alongside a miniature outdoor town which has 24 buildings, created on a 5/8th scale, that represents area businesses and homebuilders. Intermingled with the buildings are paved and marked streets, complete with working traffic signals, a railroad crossing and a toll booth." Each year, the public school kids (and other school groups for miles around) visit safety town, and learn about different things. We went to the third grade class about Bicycle Safety. After class, the kids got to ride bikes (provided) through safety town! It was really a lot of fun. Other classes offered at Safety Town include 9-1-1 and Emergency Safety (Kindergarten), Motor Vehicle, School Bus and Pedestrian Safety (this is the first grade class, and they get to ride Jeeps around Safety Town), Fire Safety (second grade - the kids are in a "house" that starts smoking and they go through various situations to learn what to do in case of fire) & Burn Prevention, Severe Weather and Disaster Preparedness (fourth grade) and Internet Safety and Personal Information Awareness (fifth grade). This place, apparently the first one like it in the US, is so cool! Momma, you can't just honk all of the rolls! JUBILEE: Do you mean "hog" all of the rolls? You know, like a hog, who would eat them all? Upon realizing her mistake, Lil Yoda and the whole Clan burst into laughter. This picture was based on my creative thinking and my friend KMe. It makes me feel happy because I love horses, and this is a picture of two female centaurs. We are flying the American flag today in honor of Patriot Day. It is difficult to teach the horrors of 9/11 to children. How do you put such things into words? How do you explain terrorist? They do not even understand hate, much less hate raised to such a degree. Yet I want them to know, to understand as much as they can, and to be part of the rebuilding process. Thus, we have been looking at pictures and talking about the tragedies of 9/11, and praying for the families that suffered the loss of a love done, and for the strength of our nation. And we will pray for those who don't know Christ, whose hearts are filled with hate instead of the love He offers. Accountability request: I have attempted a couple of blogs in the past, but never seem to find the time to keep them up and, alas! they find their way onto the list of Things I Intend To Do Someday. And put them in prison. And turned them back to Him. He was the one who calls Himself a Lamb. To do things He used to do. He made all of us.